Somehow, the only time I’ve talked about Horizon Zero Dawn here on The Reticule was during EGX 2016 where I squeezed in one small paragraph about the game in my Day One Report. I really don’t understand how I didn’t take a closer look at the game before launch back in February, or even after I started playing the game in May. It is quite brilliant, and surely a highlight of this generation, and shockingly is actually an open world game that I have completed. After my initial dabblings with the game in May, I put it to one side for one reason or another before picking it back up in early July and sinking many evenings of play into it. I’ve spent upwards of 60 hours with the game, have completed the main quest and the majority of side missions, leaving only the odd collectible to find. I don’t often finish open-world games. I’ve still got vast chunks of story to work through in The Witcher 3, Final Fantasy XV seems dantingly big while I never got my teeth stuck into Far Cry 4. But Zero Dawn got me, and kept me going. While a lot of this was down to the wonderful story, a large part of it was the variety found in the open world environment. My mind is immediately drawn to the adventures of climbing Tallnecks and exploring Cauldrons. For those who haven’t experienced the wonders of this game, Tallnecks fill the basic open world trope of revealing parts of the map, while Cauldrons are mini-dungeons that grant you powers to override and take control of the machines which inhabit the lands. In some games, these would be fairly formulaic activities to complete to help you on your way with little, to no, variety on offer. What Zero Dawn does is ensure each encounter with a Tallneck, or journey to the depths of a Cauldron are different from the other. Tallnecks are huge, passive machines which you need to climb to the very top of to override and reveal the map. You can’t just start climbing from their legs though, there aren’t any hand holds down there. Instead, you must find a suitable vantage point from which you can jump onto the back of the Tallneck. Fortunately, they follow a set path and don’t divert from it, but finding a suitable jumping off point is key. My first encounter with a Tallneck was lesson in learning how to climb them; identify their patrol route, scout the surrounding lands and buildings for a vantage point, then jump. Simple. Each other Tallneck presented a different challenge. My favourite saw the Tallneck patrolling a large natural bowl, an area inhabited by human Cultists who play a key role in the main story. Seeing them in this location, with the assorted machines with them, offered both a challenge in deciding how to get to a suitable jumping off point, and providing more clues to the devious nature of what the Cultists were planning. A stealthy approach didn’t work out for me, but by using the variety of tools and weapons at my disposal, I was able to clear a path to a suitable location to jump onto the Tallneck from. Another Tallneck that sticks in my mind was the last one I came to climb and override. Wandering around a dusty plain, it wasn’t clear what the best point was to take the jump. There were numerous other machines in the area, both low-level surveillance machines, and a variety of mid-tier beasts who, by themselves, would have been easy to take down. But with such a variety of machines, any assault would lead to an almighty battle. After a few blundering attempts at taking out different groups of the machines guarding the Tallneck, I adopted the stealthy approach. Skirt around the edges of the Tallnecks patrol path to find a suitable jumping off point with the least patrolling machines. Sneak through the long-grass to avoid detection, take out a Watcher with a silent one-strike kill, then I was free to jump onto my target. Each Tallneck offered a different challenge, some of which offered an insight into the wider story that Zero Dawn was telling. Yes, they served a purpose for revealing vast swathes of the map, but the journey was worth it. It worked in a similar fashion with the Cauldrons. Dotted around the landscape, unless you wandered right past one, you wouldn’t necessarily know it was there, unless of course you had climbed the nearest Tallneck and had the location marked out. Each Cauldron was different, some wildly so. The first one you come across during the game is very much an operational machine building facility. Crawling through the inner-workings of a machine facility was unnerving, everything felt so alien. Great design work from Guerilla Games to set these structures apart from the wonderful natural environments you walk through out in the open-world. The first Cauldron was an unnerving, alien experience, but again, every Cauldron offered a different experience. In one, the main entrance had long been ruined, and finding an alternative entrance is a challenge as you have to work past a group of Stalkers, machines with cloaking tech that require quite a beating to take down. A short journey took me to the core of the Cauldron, where a Tunderjaw lay in wait. The Thunderjaw is the most powerful machine you will encounter, and provided me with an exhilerating battle that I survived by the skin of my teeth. Another Cauldron again offered an entirely different experience. Half-ruined already, and being excavated and explored by Cultists, it has a feeling more reminiscent of Indian Jones than anything else in the game. 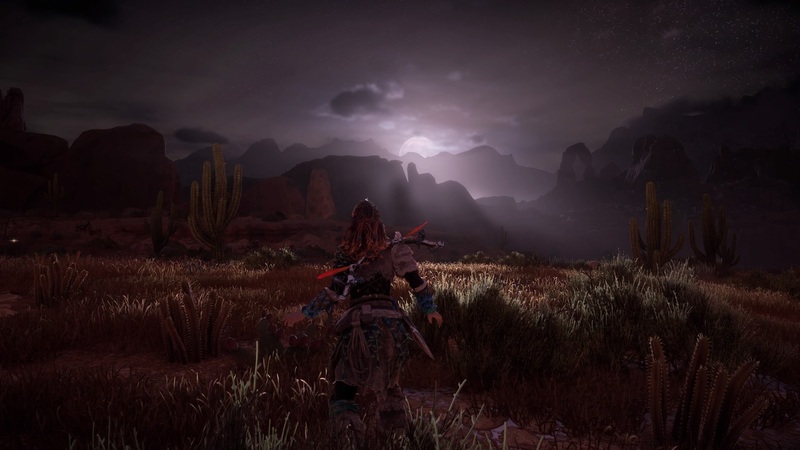 The story of Zero Dawn was of course the main driver for me to continue playing, but the time and effort Guerilla Games had put into the extra parts of the game is clear. They made exploring the world and completing what can quite often be fairly mundane tasks in other open world games, a thoroughly enjoyable experience, offering real incentive to see what new approaches you would have to take to complete these activities.